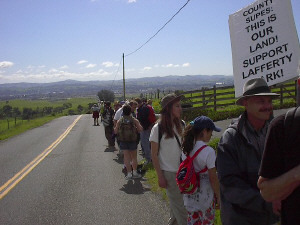 Images of the March 24, 2002 "A Walk to the Park"
Rest stop on lower Sonoma Mountain Road. The destination: Lafferty Park gate, adorned with lilies in memory of the late Dan Jaffe. 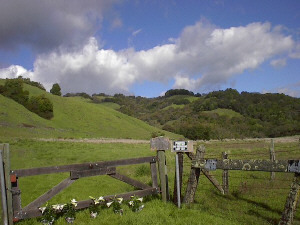 The hills and ridges in the background are part of Lafferty Park, for the most part, but only a small portion of the park is visible from the gate. 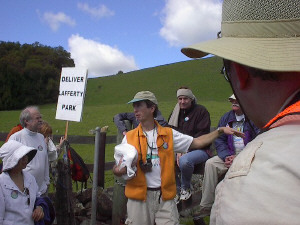 Part of the mini-rally at the gate. Bruce Hagen unfolds the material he carried up the mountain that will become the Lafferty community quilt.